Today’s Nice Price or Crack Pipe Alfa is claimed to be ready to race on Sunday and then drive to work on Monday. It’s a lot more track than trip, but will you give its price a black flag from the start? Another kind of Black Flag is the seminal So-Cal punk band whose songs advocated defiance of authority, non-conformity, and of course, TV parties. You can bet all that got them noticed by the same government agencies against which they were railing, and hence it would have been likely you might have seen cars like yesterday’s 1973 government-issue AMC Matador outside any of their early gigs. Just like that band very few of of you felt conformist, and the Matador’s price fell to both anarchy and a 77% Crack Pipe loss. And now, let’s go to tech inspection. To paraphrase Red Green, if you can’t be handsome, at least be handy. 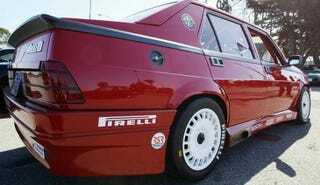 You’ve really got to hand it to the builder of this 1987 Alfa Milano. After all he’s taken an ugly duckling of a car (seriously Alfa, woof! ), and has turned it into what looks to be a snarling swan - you know, one of those really mean suckers that goes straight for your crotch. According to the ad, this Milano (75 to you Your-a-peeins) started out as a rust-free, low-mileage car living a humdrum life on California’s Central Coast. Using that as a base, it was then turned into a pseudo DTM racer that the seller claims is still street legal. The ad also notes 113K on the clock, and 3,500 on the build - and I’m guessing a good bit of that latter came on the track. The car rocks a 3-litre edition of the funky Alfa V6 that’s been pulled from a 1995 164S. That’s received bigger injectors, CAT CAMS camshafts, and a BMW MAF meter. Headers take the exhaust to side dumps in the rockers just ahead of the rear wheels. The Milano may not have been all that handsome up top, but its Alfetta-derived chassis is beautiful to behold underneath. That’s a torsion-bar and A-arms IFS and a DeDion rearend with transaxle offering near-perfect balance. Here that transaxle is a 5-speed as you would expect, backed up by a locking diff. No word on how the famously fragile internals of the transmission are holding up, but a quick drive would tell. The suspension has been upgraded to coil-overs in the back, along with poly bushings for that squeaky, rock-hard feel. The interior is a stripper, but not the kind that you stick dollars in their g-strings. There’s still the stock dash but everything else - including the cool Frankenstein switch E-brake - has been given the heave-ho to make room for a full cage. You’ll need to climb over that to get into either of the two Sparcos (Sparcoes?) now in residence. On the outside the car has been beefed up with deep ground effects, newish paint, and a few sponsor stickers scattered about. I don’t think however, that BOSCH would actually pay you anything for having their name on the car. Nonetheless, the question of the moment is whether you think anyone should pay $28,000 for this built-up brawler. For comparison, here’s one in Great Britain that’s a little less country and a little more rock and roll, er, less street and more track. What do you think about our red friend here, is it worth its $28,000 asking price? Or, is that price for this Milano just not how the cookie crumbles? H/T to Ryan McGinnis for the hookup!